From a freshman’s first days on campus through to graduation day, many students can feel their college experience fly by in an instant. Yet, preparing for the culmination of what has often amounted to four years (or sometimes longer) of college life is no small feat in itself. Plans for the Graduating Class of 2014 have been in full swing on campuses around the country, and since early March, Grad Fairs have been providing students with a wealth of resources ranging from career counseling to financial advice. In many of them, the Barnes & Noble College bookstore has become the focal point of preparedness for students anxious to make sure they’re ready for one of the biggest days of their lives. Despite a reputation for being a class of students quick to distinguish themselves from earlier generations, when it comes to graduation, it seems that the traditions of pomp and ceremony are still much sought after. In the bookstore, that sense of celebration has been put front and center. “This year we’ve moved our graduation display to the front of the store,” explains Assistant Manager, Lisa Towns. “Every day of our Grad Fest we either gave away tassel key rings or entered customers into a raffle to win a set of regalia,” she adds. Both Nelson and Towns also acknowledge the support of an important partner in the graduation process which helped ensure their event’s success. “This year, we consolidated all of our grad products through Herff Jones, which enabled us to present really exciting regalia packages and bundle together some great value for our students,” Nelson explains. 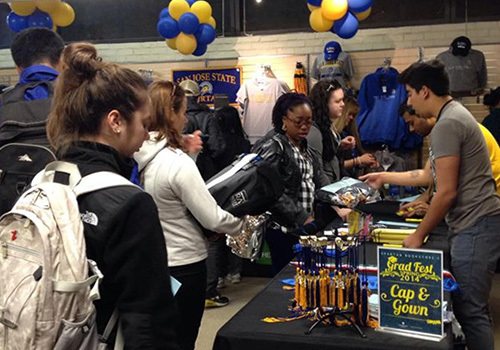 The Grad Fest at San Jose State University’s Spartan Bookstore provides an easy one-stop-shop for students to order their graduation regalia, class rings, graduation announcements and more. 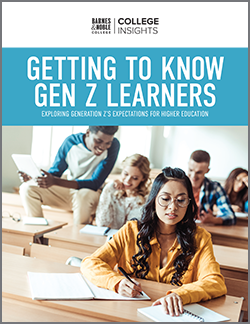 Herff Jones provides a full range of caps, gowns, diploma frames, graduation announcements and graduation rings for many college bookstores, but the relationship is deeper than that. “We work with the bookstore manager on scheduling events,” explains Ken Langlois, Vice President of Sales for the College Division of Herff Jones, Inc. “We can help develop marketing pieces to email to students or place on the university websites, or create individual marketing pieces to reach parents for example,” he adds. Once the event starts, Herff Jones staffers work with bookstore management to help service the college’s graduating student body. 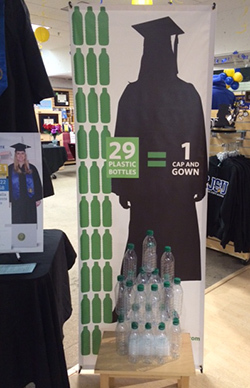 A display at the Spartan Bookstore shows how many water bottles were used to create a “green” graduation gown that students can order for commencement. At SJSU’s Spartan Bookstore, that effort certainly paid off. The event was the most successful ever, with the store selling more grad rings in one day than at all of last year’s events put together. But in addition to the boost in sales, Nelson has another way of measuring its success. “We had a lot of participation by the students and created a lot of affinity with the event,” he says, pointing out that creating school spirit in an urban campus as large as SJSU isn’t always easy to achieve. It was also a successful grad event at Liberty University in Lynchburg, Virginia. 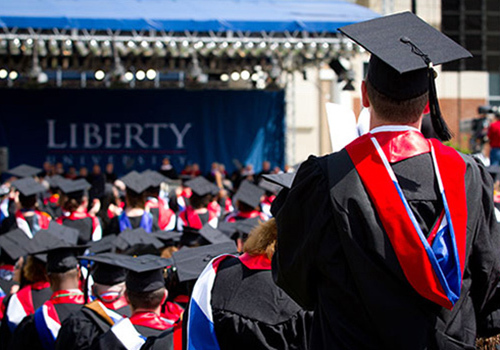 “We had one hundred grads come through the store each day,” explains Liberty University Bookstore Manager Kathy Scarborough, whose event also helped boost the number of students who will walk at the college’s graduation this year. Scarborough and Nelson both cite the importance of their bookstores’ relationships with the campus administration, saying that partnering with the President’s and Registrar’s Offices, Graduation Committee and Alumni Associations have helped spread the word and develop a greater awareness for their graduation events. “Communication is the important part,” agrees Laurie Woo, Manager of the Ole Miss Bookstore at the University of Mississippi in University, Mississippi. “Our goal was really to make the preparations for graduation simple, comfortable and fun as seniors don’t always know what to expect,” she says. 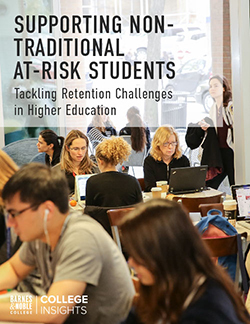 Spread over the different Ole Miss colleges and campuses, awareness for the grad fairs was spread by in-store pop-up displays, and email and social media postings.